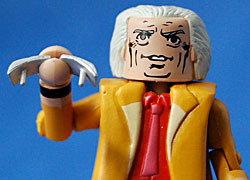 When I got excited for Back to the Future Minimates is was explicitly for the figures from Part II, specifically from the 2015 sequence. You see, Minimates work best with bright colors and, we'll say, "artistic" costumes - both of which the 2015 sequence is rife with. 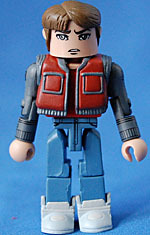 So a chance to do four of those characters/costumes in a set not only would be great for us BTTF fans but would be an excellent collection of Minimates. The promise of such a set was never realized though, and instead we get a hodgepodge of characters from all three time periods in BTTF II. I suppose it's a fair choice to go that route, but really that's a decision that says "we don't believe in this property" becuase there are too many iconic looks in this film to just trim all of them down to only four figures. An especially frustrating proposition when you consider that Marty McFly alone has four signature looks in the movie! 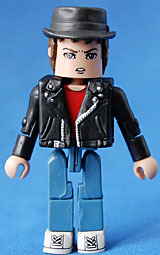 Future Marty is one of the most iconic things from the BttF franchise and this Minimate does a good job of capturing it. Like the other Marties in the line he gets large, stylized eyes like the early Minimates of yesteryear, which somehow makes him look more like Peter Parker than Michael J Fox. The "style" especially stands out among the somewhat more realistic portraits on Doc and Biff. The signtaure 2015 jacket looks pretty good, though for some reason it was either sculpted or tooled a little too short and thus rides above his waistline giving it an odd look. He also gets all new sculpts for the famous power-laced Nike shoes. Sadly, those have zero paint applications so they're not easy to notice, plus their bulk keeps his legs at a bit of an angle. He does come with the famous Hoverboard and it turned out much like Marty: great but for a few odd details. The sculpt is spot on and it has a footpeg for easy riding. The top of the board has a great print that captures the look well, but the underside gets nothing, not even gray for the magnets. 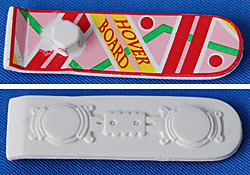 What's more, the board's base color is inexplicably white, rather than the film-accurate pink. Still though, this does a pretty solid job of scratching my Future Marty itch. 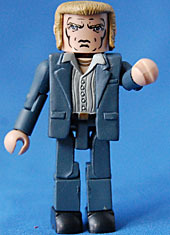 Doc's future outfit is super recognizable, and this figure captures it quite well! The shirt and tie are part of the same mold as the overcoat and the tie is painted pink to allude to it being transparent as in the film - a great detail! They did a really good job on the watches on each wrist plus the boots he wears. Sadly they went the same route as the first boxset and sculpted a new head for Doc that includes his hair. It's okay for what it is, but it fails with the metal visor/glasses. They're done as a removable piece so the head also has two pegholes in it - nice... Plus, when it's on, the visor rides a little low (or the face is printed a little high) so it ends up just looking weird. I get that they thought they were solving the "receding hairline" issue but why this wasn't two interchangeable hair pieces, one with the visor sculpted on, is beyond me. This was the four-pack I was waiting for. A chance for DST to dive into the 2015 costumes and really highlight the great aesthetic of the Minimate format. 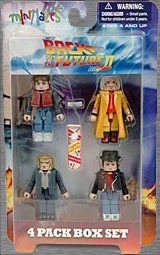 I was certain that BTTF II was the one that would open a lot of non-Minimate-fans' eyes and draw them, so I was utterly flabbergasted when I saw this set. While 2015 is represented, only 50% of the set comes from that sequence, with 25% from Alternate 1985 and 25% from 1955. The only connection was that these characters all apeared in the same movie, but gone was any sense of cohesion or theme within the set. Alternate 1985 Biff 100% nails the look of Biff as the rich a-hole, with a nice side-burned hairpiece, puffy and stern face and a new retro style shirt/coat sculpt. So... why is this the most aggravating figure in the set? Because a) he breaks the 2015 theme and b) he's in the less significant of the two "Alternate '85" costumes Biff wears! This costume has the distinction of appearing in but a single scene. When all he does is yell at people. Sure it makes sense to do, but really only if there was an Alt '85 Lorraine. Or if this set came with T-Shirt Marty. As is... there is no one for this figure to interact with. Enjoy being utterly useless, Biff! He also gets zero accessories (a liquor bottle maybe?). "Oh but Rustin, the other option is him in a robe, who wants that?" How about everyone? At least in that costume he has some bearing on the plot of the film, appears in multiple scenes and could include one or two logical, if not significant accessories! Each time period represents a 30- to 60-year gap between one another, so not only are there substantive costuming differences but each time period has its own storyline and tone. Fundamentally these characters do not fit together in one set. As discussed previously, character selection - especially in multi-packs - needs to follow a theme in order to work. It provides the consumer/collector with a sense of completion, a sense of cohesion. And how would you like a little insult with that injury? The final figure in the set isn't a figure from 2015 either, or even Alt 1985... it's 1955 Spy Marty! Yup. Another figure with zero relation to any other figure in this set. He gets a hat wearing hair piece, with a surprising and distractingly high hairline. He also gets a new biker-eque leather jacket, which does look fairly great. How about accessories? Nope. No walkie talkie or Sports Almanac. No alternate arms to make the "just T-shirt" look or hat-less hair. You're just stuck with him looking as confused as we are as to his includion. It's becoming increasingly obvious that DST made these sets as cheaply as they possibly could, and as both a big Minimate and big Back to the Future fan that's really dissappointing. By limiting themselves to four figures per film, they denied themselves the ability to get out some great figures and to make decent money. However, this set just moved at an okay pace, not doing as well as the first. Similar to the "Enchantment Under the Sea" sub-theme, they were able to get out a couple more figures in the two-packs to fill in some of the holes, but even in those the sets had a disconnect and showed continued and fundamental misunderstanding of what draw people to products. 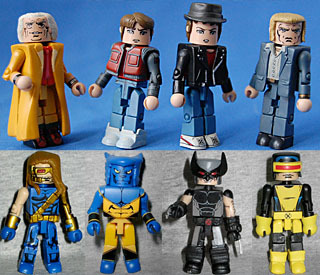 Think of the Marvel Minimates multipacks: they're all themed around a particular team lineup, era or event. What DST did here was take BTTF II as an overall total then pulled from it, just as if they were to take "X-Men" as a theme and then put out a four-pack with Age of Apocalypse Cyclops, New X-Men Beast, Uncanny X-Force Wolverine and silver-age Cyclops. One would just look at that in confusion and wonder what the hell they were thinking, and it's the same here. Perhaps they think that by spreading out the releases it would string shoppers along with the promise of more to come, but instead that model only succeeds to alienate consumers, especially for a line like Minimates that is not that easy to come by, particularly for the fabled casual buyer. It suggests a basic assumption that people will seek out the product when in reality such a niche brand needs to seek out shoppers. 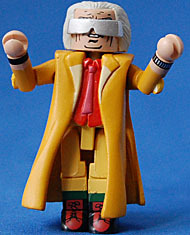 While a casual shopper might be interested or even excited to stumble upon BTTF Minimates, how would a hodge podge of character (again, particularly for a movie known for having such distinct sections) appeal to them? The Marvel Minimates remain so wildly successful because they've tapped into a big subset of the massive Marvel collector populace, and all of those sets have an overall theme (within box sets or across a series of two-packs) so why would that same logic not be applied to something without an immediately accessible collector-base and far less exposure? Taken in context of the entire Back to the Future Minimates line, this is a good set with some great iterations of beloved characters but it fails to come together as a four-pack and opens the collection to suffer many more holes in it.